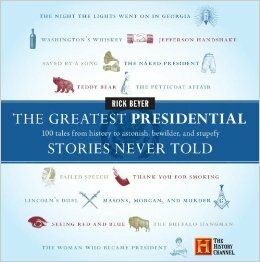 The Greatest Presidential Stories Never Told by Rick Beyer provided a quick, educational read for President’s Day this year. This little book includes 100 “tales from history to astonish, bewilder, and stupefy”. The book did not disappoint. Beyer set out to clarify rumors and old wives tales told about many of our Presidents and I found them fun and interesting. I knew some of the stories, but many were new to me. Lincoln’s son Robert was in attendance when three presidents were shot. Obviously, he wasn’t the shooter, but what are the odds? John F Kennedy may have had a secret marriage prior to marrying Jackie? Really? Jerry Ford pardoned famous Civil War General Robert E. Lee? How did I miss that? I think you will enjoy this book and the facts contained inside. Fact, especially when it comes to government officials, can be stranger than fiction! This entry was posted in Uncategorized and tagged government, history, Presidents Day, Rick Beyer, The Greatest Presidential Stories Never Told, The White House, US presidents. Bookmark the permalink.